The red-legged salamander is a small but prolific predator. A new study has found that salamanders play a significant role in the global carbon cycle, and affect the ecosystem of a forest. Collectively, they could help stave off climate disaster, according to a new study. If someone asked you to name the top predator in North American forests, you might think of bears, or maybe great horned owls. But here’s another answer to think about: woodland salamanders. These skittish, slippery amphibians literally live under a rock, or a log, or any convenient dark and damp forest habitat. As apex predators go, they are mainly small, a few inches long and weighing well under an ounce. But they are hugely abundant – and very hungry. On an average day, a salamander eats 20 ants of all sizes, two fly or beetle larvae, one adult beetle and half of an insect called the springtail. And in doing so, the salamanders collectively affect the entire course of life in the forest – and perhaps far beyond. According to a new study in the journal Ecosphere, salamanders play a significant role in the global carbon cycle. If flatulent cattle are among the black hats of climate change (the livestock industry emits 14.5 percent of human-associated greenhouse gases), then salamanders may just be the white hats, helping to stave off climate disaster. If no one has noticed this before, well, this is how it goes when you live under a rock. 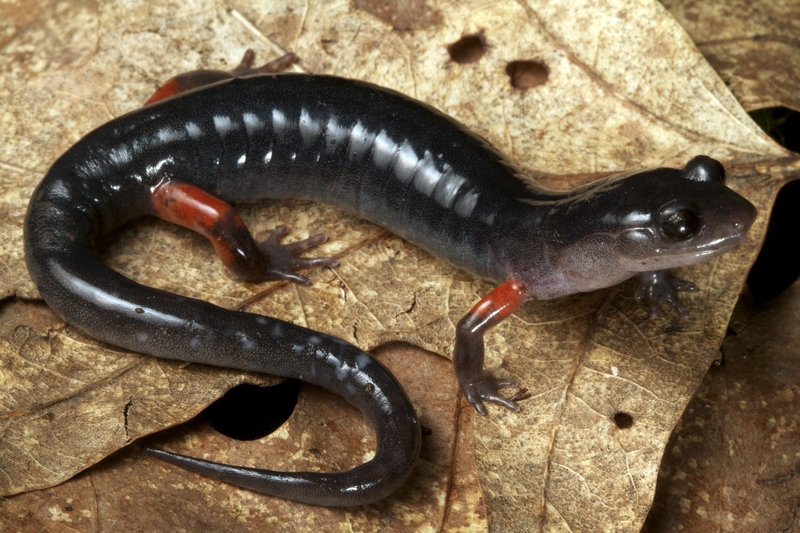 The study – by Hartwell H. Welsh Jr., a herpetologist at the U.S. Forest Service’s research station in Arcata, Calif., and Michael L. Best, now at the College of the Redwoods in Eureka, Calif. – notes that salamanders’ prey consists almost entirely of “shredding invertebrates,” bugs that spend their lives ripping leaves to little bits and eating them. Leaf litter from deciduous trees is on average 47.5 percent carbon, which tends to be released into the atmosphere, along with methane, when the shredding invertebrates shred and eat them. If there aren’t as many shredders at work and the leaves remain in place, uneaten, they are covered by other leaves, “like being trapped under a wet blanket,” as Welsh put it. The anaerobic environment under those layers preserves the carbon until it can be captured by the soil, a process called humification. At least in theory, having more salamanders in a forest should mean fewer shredding invertebrates and more carbon safely locked underground. The researchers tested this theory in a forest in northwestern California, laying out a series of 16-square-foot enclosures, like containers for raised-bed gardens. Some of the enclosures had salamanders, others didn’t. Each enclosure was joined to its neighbors by low, screened openings, so invertebrates could move freely back and forth, but the salamanders had to remain in their enclosures. The presence of salamanders resulted in a significant decrease in shredders: fly and beetle larvae, adult beetles and springtails. In the plots with no salamanders there were more shredders, and they consumed about 13 percent more of the leaf litter. Almost half of that lost weight was carbon, released into the atmosphere. The authors calculate that woodland salamanders at the density in their study would send 179 pounds of carbon per acre of forest down into the soil, rather than up into the atmosphere. Extrapolated to the huge numbers of salamanders and other predators working in the leaf litter of forests around the world, that is enough to affect global climate. Another factor is that many salamanders have no lungs. About 70 percent of all salamanders belong to a single family, the Plethodontidae, which in effect breathe through their skin. The process requires much less energy than breathing with lungs, enabling salamanders to “be really small and exploit really tiny things that are not calorically sufficient for birds or mammals,” said John C. Maerz, a salamander specialist at the University of Georgia.